I always have a tough time birding in the winter. Part of the problem is that birds are more scarce, and when I don't have a lot of time to go birding, I tend not to see as much. With a lot of snow until recently during our January thaw, I have had a lot of action at the feeders as in last month's post. A lot of the birds, mostly Titmice, Chickadees and surprisingly the Redpolls, when it is cold/snowing, have little shyness. I visited Chimney Point the other day, hoping to see some birds on the water with the ice melting in our balmy 40-50 degree weather. 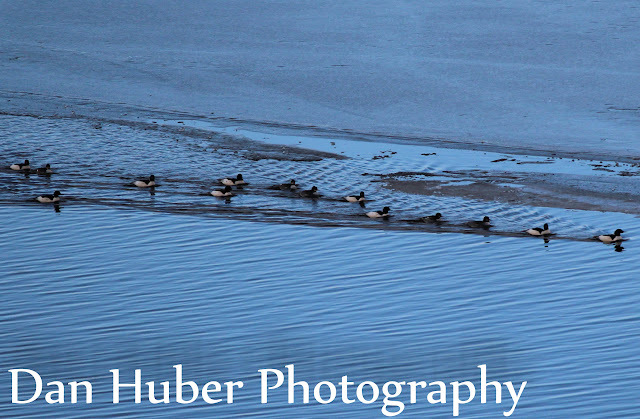 Although not super close up, I like these shots of Common Mergansers. I usually have only seen a couple at a time. Here there were several hundred. That's some fine winter birding Dan! Nice shots! ...a redpoll sitting on your shoulder and one eating out of your hand! Wow...and cool! 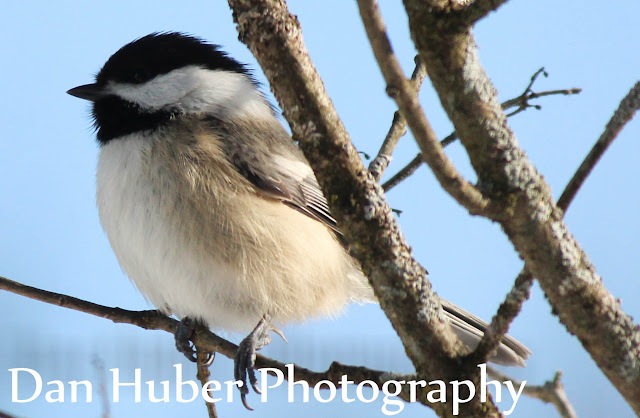 ...also, love the cute chickadee shot. Absolutely gorgeous. Reminds one how worthwhile it is to stand in the cold! 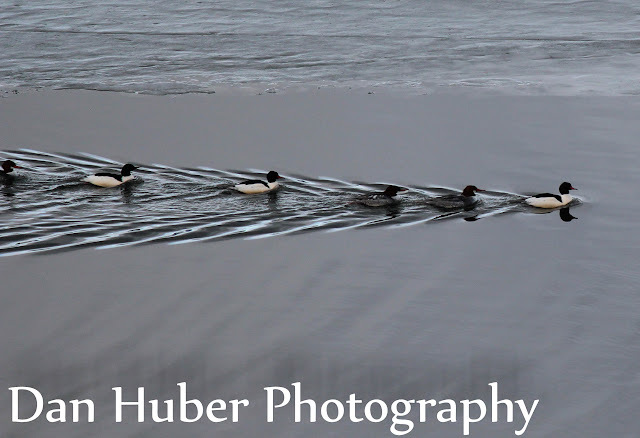 Wonderful photos, love the mergansers. 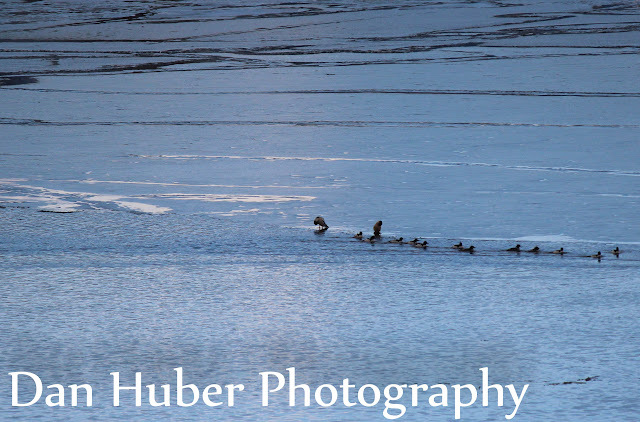 Winter has such special qualities of light, and does offer some amazing photo ops. Now if I could just learn how to keep my fingers from getting cold. 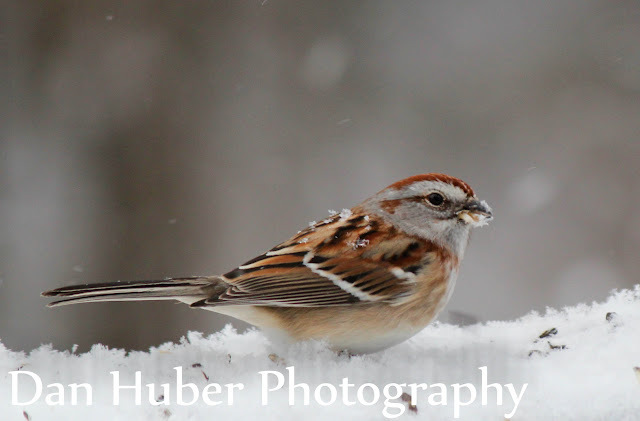 Beautiful winter birds featured in this post, Dan! 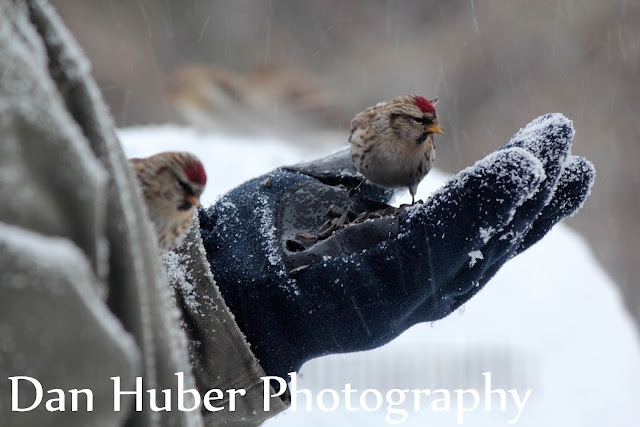 How lucky you are to have the redpolls eating our of your hands and landing on your shoulders. Congratulations on the life bird! 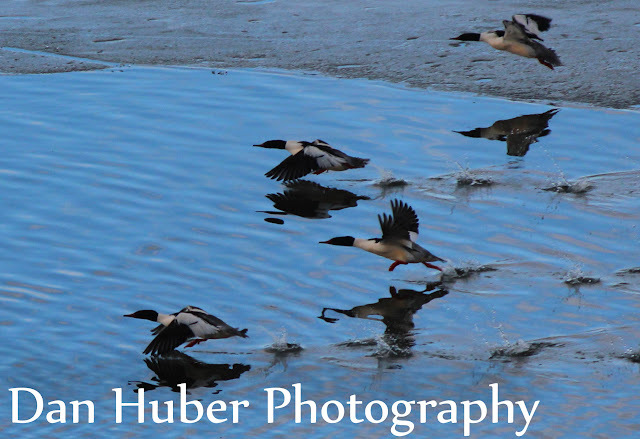 The in flight Common Merganser photographs are especially stunning. Thank you all for the very kind comments. It is very appreciated. 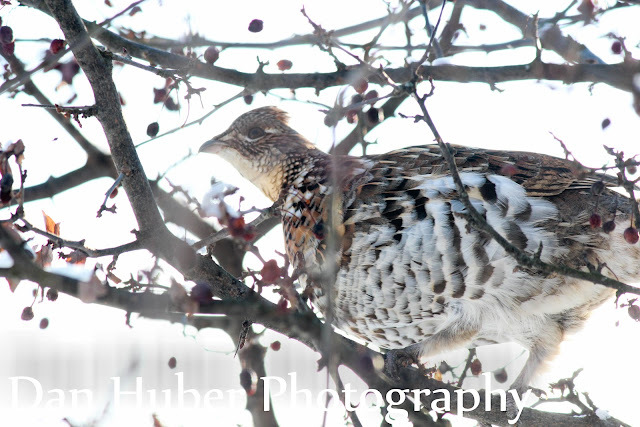 Great winter birding, Dan! I am just amazed at the Redpolls feeding from your hand! 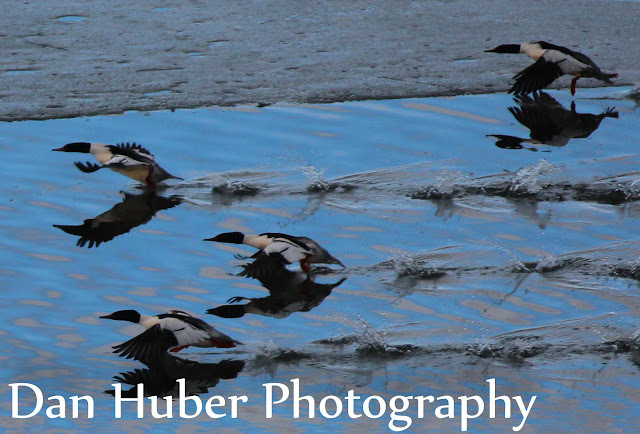 And the Merganser shots are awesome. Wonderful photos, Happy Birding! The Redpoll photos are really neat, Dan. How long did it take for one to land on your shoulder? Thanks Eileen and Hilke. 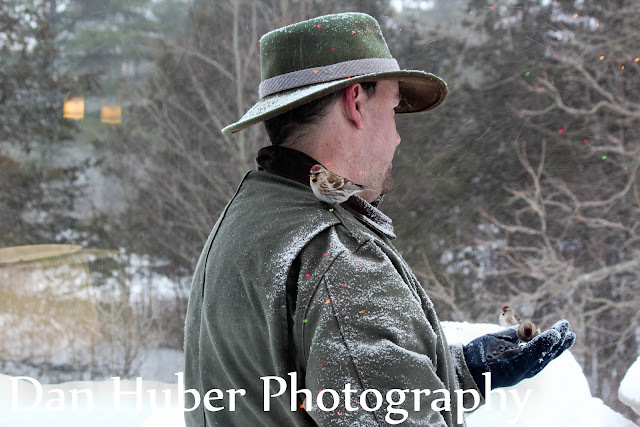 It was pretty cold and a couple feet of snow, so i just edged closer slowly over 10 minutes and they kept feeding at the feeders and starting landing on me too. I love this post and the images Dan!